For almost as many years as I've been writing audio reviews I have followed the work of Michael Griffin, head of Essential Sound Products (ESP). While branching out and selling out have become common in the business world, Griffin has stayed true to his mission of making power cords and power distributors, deciding to be a master of one discipline -- power delivery -- instead of the proverbial jack of all trades. I've always thought this was a particularly shrewd strategy on his part. The complexity of modern life, let alone of the high-tech economy, makes it abundantly clear that you're far better off having a depth of knowledge in one area than knowing a little about everything, and depth surely applies to Michael Griffin. of your electronics' own sonic signatures. However, with the introduction of the Essence Reference-II products, by far his most expensive, I wondered if Griffin had begun to lose his way. A couple of years ago, I reviewed his MusicCord-Pro ES power cords and power distributor on The Audio Beat, calling them his best products yet -- not his best overall in strict sonic terms, but certainly the sweet spot in his product line, where maximum sonic return for each dollar spent resides. I also posited the notion that the MusicCord-Pro ES power cords were perfect for OEM use -- included with electronics, no matter their cost. At least one manufacturer -- Convergent Audio Technology -- agreed with me and included a MusicCord-Pro with each amp or preamp sold. But then came the Essence Reference-II products, which, at $1999 for each cord and $2999 for the power distributor, comfortably leave the affordable realm, reaching as they do for the upper crust of the audiophile market. How would these new products align with the existing Essence Reference and, more importantly, the MusicCord-Pro ES products that I had praised so highly? Had Michael Griffin lost his way, or had he taken a series of purposeful left turns into audiophila's nether regions? For his new top-of-the-line products, Griffin targeted a few ways in which he wanted to improve upon his existing power cords and distributors, including their terminations, which he considers "critically important to realizing all the performance potential the cable affords." For the Reference-II products, he chose Furutech connectors over several others that he auditioned, citing their "improved performance." Translation: better sound! The important feature of these plugs and IEC connectors is the internal use of ultra-pure, unplated copper instead of brass, copper being the ideal complement to cable's high-purity copper conductors. From end to end, the Reference-II power cord's current-carrying components are pure copper with no metal plating or even solder, which Michael Griffin considers "technically a contaminant." And because copper oxidizes, each connector is filled with epoxy after termination. This hermetically seals the internal components and prevents oxidation. The cable itself incorporates the improved conductor spacing and patented geometry developed for the original Essence Reference. There are no internal air gaps or soft filler materials, which keeps the cord's geometry and electrical performance intact even as the cord is bent, an inevitability given its use beneath and behind equipment racks. Michael Griffin is an advocate of cryogenic treatment, which is done to minus 300 degrees Fahrenheit to the entire power cord, not just the wire or connectors. As he explained to me a few years ago, we have been conditioned to think that there are fewer grain boundaries within the wire after cryogenic treatment, but there actually may be more. So, in his words, "What cryogenic treatment does is create such internal pressure that grains realign for better surface-to-surface contact. Any spacing between grain boundaries is significantly reduced. . . . Bottom line, electrically, is that cryogenic treatment has close to the same effect as if it were eliminating grain boundaries altogether -- lower resistance, and more current with fewer distortion effects due to the grain boundaries." 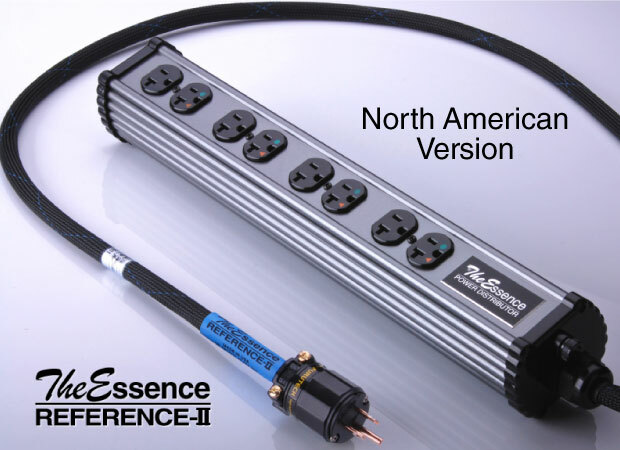 The Essence Reference-II power cord is designed for maximum power throughput. The matching power distributor has the same goal, but with the added benefits of preserving the qualities of the power cords and spreading them to more than a single component. There is, however, no array of esoteric filters, no isolation transformer, no power-regeneration circuit. There is overload protection, "Just what's needed, nothing more," according to Griffin. What's used, in fact, is a two-stage system incorporating surge/spike protection between the hot and neutral legs of the circuit and a fast-blow ceramic fuse for severe overload protection. The distributor's anti-resonant, RFI-shielded aluminum chassis is damped with a proprietary material to mitigate the effects of airborne and structurally transmitted vibration. So while the power distributor does what its name suggests, it also accomplishes much more, including protecting whatever it powers. Michael Griffin sent me a number of Reference-II power cords and a single power distributor, which has eight outlets, enough for my entire system, no matter the electronics lineup. I used everything with different combinations of preamps and amps from VTL, Audio Research, Convergent Audio Technology and Lamm, along with both analog and digital sources. Griffin stresses that quick A/B comparisons are not really feasible with his products, because the power supply of each component (mostly the capacitors) slowly undergoes additional break-in with his products. Fortunately, slowly means over the course of days, not weeks or months, so you can avoid the drudgery of re-break-in if you use your system regularly after adding the ESP products. "I know you can't verify this with testing," Michael told me, "but we're one of the few cable manufacturers that posts lab measurement data about our products on our website." While I'd like to confirm or deny the claim of component break-in, that's impossible to do, given that any swap of cables in a system reveals sonic differences. It is true that the sound immediately changed to noticeable degree when I inserted the ESP cords and distributor, but that also happens with other manufacturers' products. It was over time when larger trends became obvious, but they could be proof of the break-in of the power cords and power distributor, not necessarily of the electronics. Still, for the sake of consistency, I used the ESP Reference-II power cords and power distributor just as I would any others: over the course of weeks and months -- the only way to assess and understand any product. Here's a bit of personal trivia, interesting or not: Essential Sound Product’s The Essence was the very first aftermarket power cord I used -- ever. It was the mid-1990s and I had just bought a CAT SL-1 Signature preamp. I was looking for ways to maximize its performance and had good results with some NOS tubes. I then heard about a power cord from a guy in Michigan that Ken Stevens of CAT, who had said his stock power cord was the best to use, recommended. I was able to hear a very early example of The Essence -- and I was disappointed. My system at the time -- the CAT preamp, a Threshold amp, Mirage speakers -- was dark and friendly to the extreme. The Essence power cord only exacerbated things, making its sonic worth in my system infinitesimal at best. Discouraged (and skeptical), I swore off power cords, but I reconsidered after some equipment upgrades and the purchase of a few Tara Labs Affinity power cords, which were worthwhile additions. Then, after seeing The Essence power cords -- and other ESP products -- at the 1998 CES, I decided to revisit the cord I had heard years before, and that put me on the path I still tread: appreciating and ultimately reviewing whatever Michael Griffin creates. It's really possible, however, to draw a dividing line between the earliest ESP products and essentially all that followed, at least in sonic terms. While those early cords increased my system's inherent darkness, later ones began to move in a distinctly different direction that, with the Essence Reference-II, has reached its fullest expression. Gone is any remnant of that darkness (a definite coloration), the Reference-II products defined, first and foremost, by their transparency to whatever they are powering. I've noted this about other power cords, but with the Essence Reference-II it goes a step further, the elemental nature of the electronics, their sonic personalities, shining through, even as they are all mixed and matched. While no one will say that Audio Research and VTL preamps and amps sound identical, even when, for instance, nearly identical tubes are used, there is a strong case to be made by combining the Audio Research Reference 10 line stage, for instance, with VTL's Siegfried II mono amps. The ESP products both halved the sonic difference and revealed the best of both: the air and space of Audio Research along with the resolute weight and rhythmic drive of VTL. And then, when a Lamm preamp or pair of mono amps is swapped in, more elemental nature and the blending of sonic signatures occurs, all for the good. This is what we want from all cables, not just power cords: sonic invisibility, letting the electronics do the heavy lifting. It's what the ESP Reference-II products do as a matter of course -- it's their elemental nature. I was also immediately aware of their leading-edge clarity and definition -- the speed into and out of each note. Paradoxically, they also imparted fullness, a sense of body, especially to singers. letting the electronics do the heavy lifting. Shirley Horn's two late-'90s albums, The Main Ingredient [Verve 314 529 555-2] and Remember Miles [Verve 314 557 199-2], are ostensibly vocal jazz, but the lineups of musicians are serious – Joe Henderson, Elvin Jones and Al Foster among the notables -- so the tunes have plenty of instrumental roaming. Both are well recorded, Horn's flinty vocals filling the soundstage, especially as her singing becomes more dynamic, made more obvious by the ESP power products. Dynamic variation, not just from song to song but even within certain cuts, is more on the micro than macro level -- Horn's singing is understated, more evocative than emphatic. Here is another thing the ESP power cords and power distributor impart: dynamic scaling and variation, especially down to the noise floor, which is even better defined, so clean is the sound. But put on music that taxes the system, like a big orchestral recording -- Telarc's "Fanfare for the Common Man," from the SACD of Copeland and Hindemith compositions [Telarc SACD-60648], will do nicely -- and buckle up, because there is no sense of limitation or coloration from these products, the tam-tam strikes cascading out of the speakers and exploding into the room. In the past I've likened the ESP "sound," such as it is, to water, and that certainly fits the Essence Reference-II products. However, there's tap water and then there's the really good bottled stuff that anyone with taste buds can appreciate, not because it has less of a distinct flavor, but because its "waterness" is more apparent, perhaps due to minerals that give it more flavor. I don't want to imply that the Essence Reference-II products have a sonic flavor over and above the other ESP products I've used -- they don't. It's just that the music is more complete, more fleshed out when that's the way of the recording, more spacious or wispy too. As with better water, if you're discerning, the difference is apparent. I've given recommendations in the past for the use of certain power cords with certain electronics -- AudioQuest and Audio Research, for instance. While Convergent Audio Technology advocates the use of ESP power cords, I can't say that they benefit from them to a greater degree than, say, VTL or Lamm. The personalities of the products always shine through -- and make an even stronger statement for themselves. I also used the Essence Reference-II power distributor with some vintage electronics that have captive power cords, just to test Michael Griffin's assertion that it extends the benefits of his power cords to multiple products. The Kenwood L-07M mono amps and a Denon DAP-5500 preamp/DAC have cheap captive power cords that are more suitable to table lamps than audio equipment. Still, the transparency that the ESP products bought to the other electronics I used was present and accounted for. While the Kenwood amps are 35 years old and the Denon preamp/DAC 25 years old, neither sound dated nor lacked for overall resolution -- this is the reason I have them. They're satisfying, and they cost me less than a pair of inexpensive interconnects. I could hear their deficiencies (a tonal thinness) as well as their accomplishments (grainless texture, a tonal evenhandedness), the ESP products making everything more obvious. In fact, more obvious could be the tagline for these products. If you like your electronics (and why wouldn't you? ), your reasons will be more obvious. The things that differentiate one recording from another will be more obvious, as will the reason you care about all of this stuff to begin with. 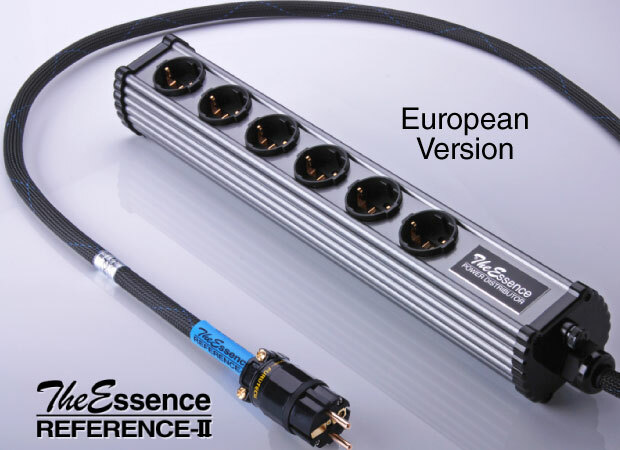 Among the power products that can be considered state of the art, the Essence Reference-II power cords and power distributor bring out more from both your system and recordings than you have probably experienced before. The approaches to delivering and purifying power are as diverse as the people who espouse them. Some use minimal or maximal filtering, often in a proprietary form, while others start at square one and re-create the AC, arguing that only this ensures strictest purity. Still others try to isolate the equipment as much as possible from the power line itself. Michael Griffin's approach is different still. While he believes in protecting your expensive audio equipment from the vagaries of AC, he also doesn't want to get in its way as it courses through your electronics. While all of his products follow this route, his Essence Reference-II products are a step beyond, maximizing AC throughput and minimizing harmful influence. While voltage is indeed voltage in terms of quantity, quality is a different matter entirely and one that makers of power products readily acknowledge. Michael Griffin may pray at this altar more than most, and his power cords and power distributors are ample proof. But that's all the why. The how involves highest-purity copper, patented geometry, cryogenic treatment and only "Just what's needed." And then there's the what: speed, large-scale dynamics and delicate contrasts, and above all transparency that leads to the fullest expression of your electronics' own sonic signatures. If you've made the AC rounds and are ready to discover if less is indeed more, Michael Griffin has nearly 20 years of engineering experience -- and a full line of power products at various price levels -- at the ready. Analog: TW-Acustic Raven AC turntable; Graham B-44 Phantom Series II Supreme and Tri-Planar Mk VII UII tonearms; Denon DL-103R, Dynavector XV-1t and XV-1s Mono cartridges; Audio Research Reference Phono 2 SE and Lamm Industries LP1 Signature phono stages. Digital: Ayre Acoustics DX-5 DSD "A/V Engine," Esoteric K-01 CD/SACD player, CEC TL 1 CD transport, Toshiba Satellite laptop. Preamplifiers: Audio Research Reference 10, Convergent Audio Technology SL1 Legend, Lamm Industries LL1 Signature, VTL TL-7.5 Series III Reference. Power amplifiers: Atma-Sphere MA-2 Mk 3.1, Lamm Industries M1.2 Reference and VTL Siegfried Series II Reference monoblocks. Loudspeakers: Wilson Audio Alexandria XLF and Alexia, Venture Audio Ultimate Reference. Subwoofer: Wilson Audio Thor's Hammer. Interconnects: AudioQuest William E. Low Signature, Nordost Frey 2 and Valhalla 2, Shunyata Research Zi-Tron Anaconda, Transparent Audio Opus MM2. Speaker cables: AudioQuest William E. Low Signature, Nordost Frey 2 and Valhalla 2, Shunyata Research Zi-Tron Anaconda, Transparent Audio Opus MM2. Power conditioners: Quantum QB4 and QB8, Quantum Qx4, Shunyata Research Hydra Triton and Typhon. 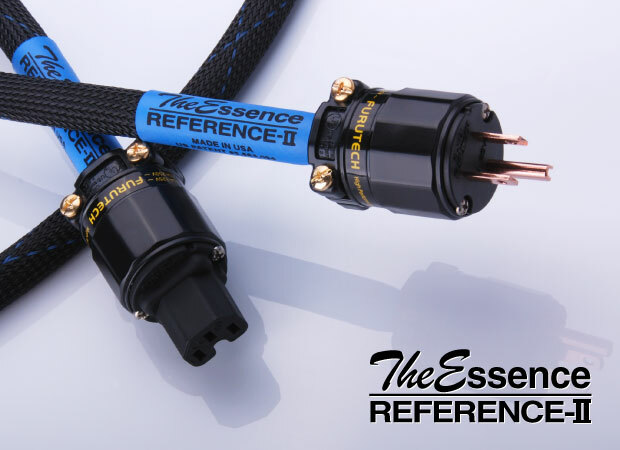 Power cords: Essential Sound Products The Essence Reference-II and MusicCord-Pro ES, Nordost Frey 2 and Valhalla 2, Shunyata Research Zi-Tron Anaconda. Equipment rack and platforms: Silent Running Audio Craz² 8 equipment rack and Ohio Class XL Plus² platforms (under Lamm M1.2 amps), Harmonic Resolution Systems M3 isolation bases. Accessories: Gryphon Audio Designs Exorcist system demagnetizer. Reprinted by permission. Originally appeared in the May 2014 issue of "The Audio Beat".